My first project for my final year of university was set by Elmwood’s Leeds studio and was to reimagine a local radio station for a world in which all cars are now automatic. 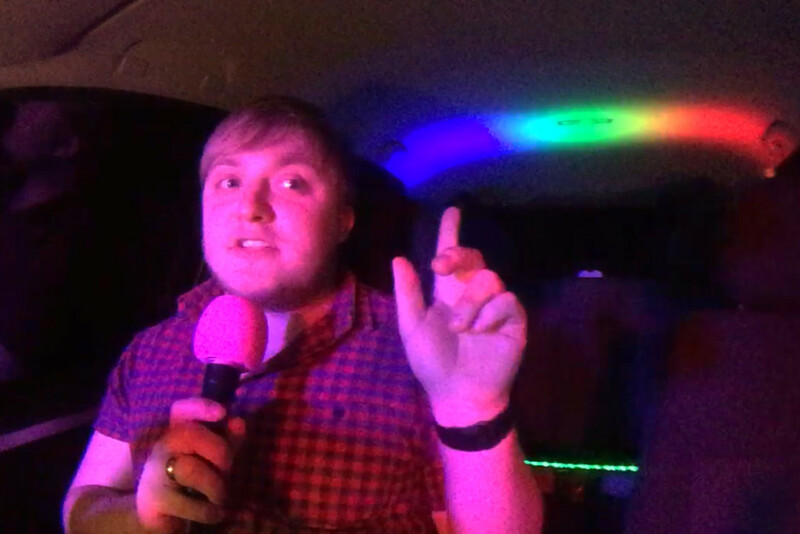 My outcome ended up being a connected in-car karaoke service, which you can find in it’s entirety within my projects section or via this direct link. 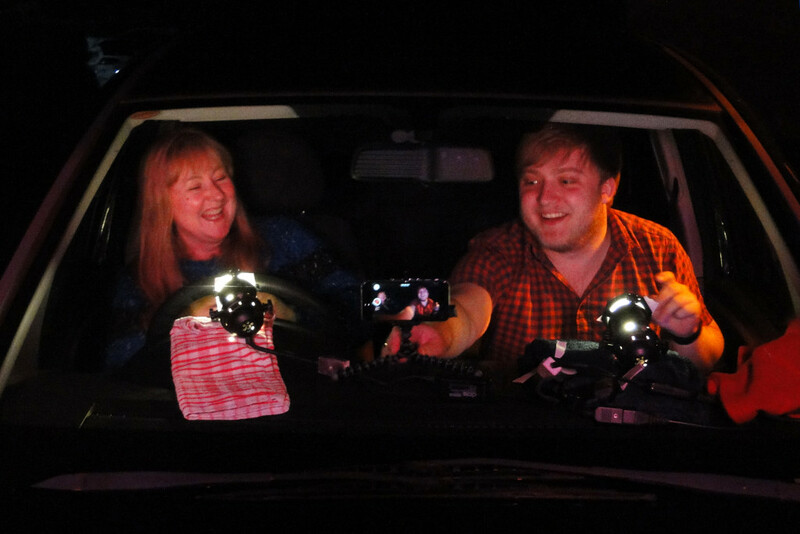 As you can see above, the video was filmed in our family car, which was stationary for the duration of the shoot despite the illusion that the car was moving down a street. This illusion was created by a set of four orange floodlights which faded in sequence to create the look of streetlights passing by as the car was in motion, coupled with the sound of a car engine running which was added in during editing. 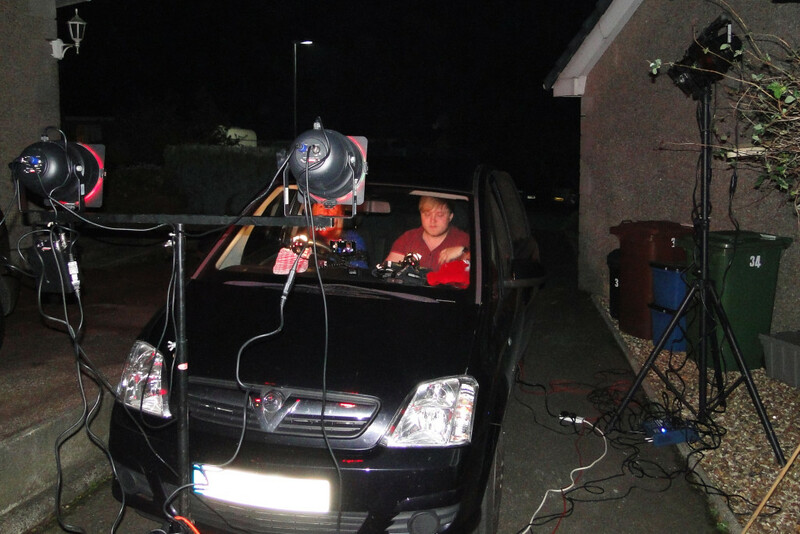 These lights are mounted on the bar to the right of the car in the image below. 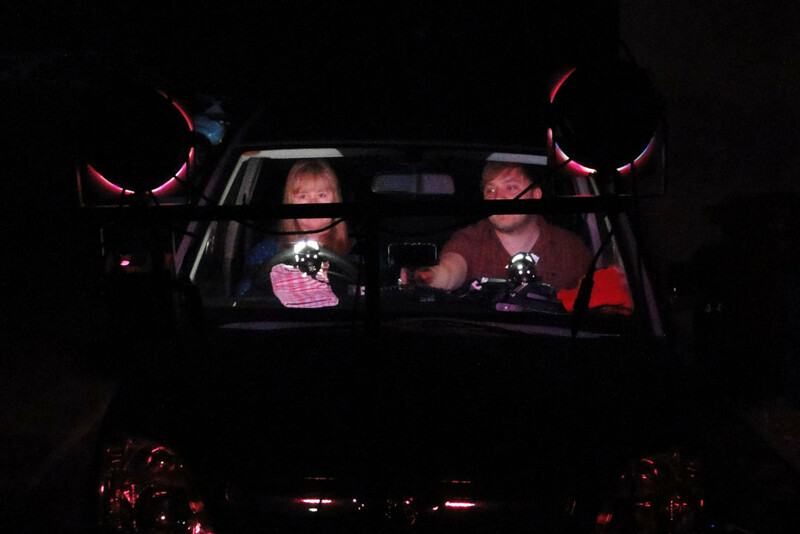 In front of the car we see two colour-changing LED floodlights, each one trained on one of our faces through the windscreen. These remain white until the song in the advert begins, when they begin to flash different colours, coupled with an elongated LED bar light which was mounted on the back seats of the car, which lit up the roof of the interior in different colours. 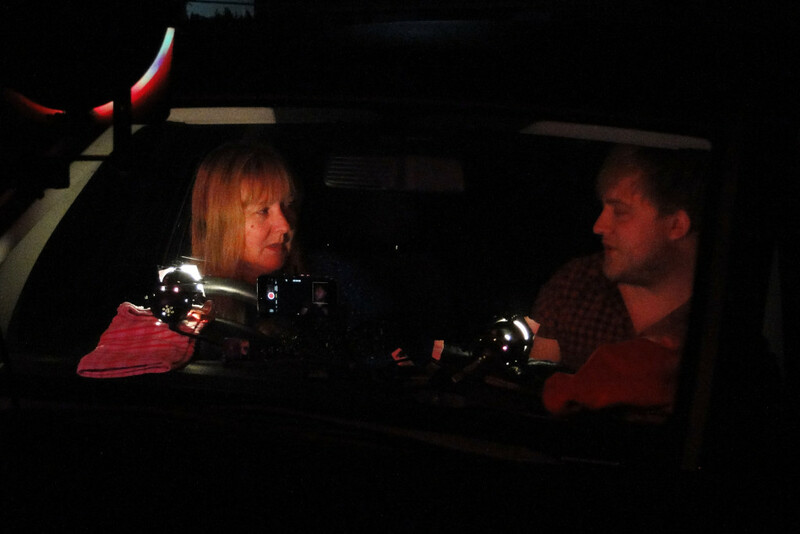 As can be seen above, I also set up a pair of white spotlights on the dashboard to better illuminate the faces during the dialogue at the start of the video, which faded out once the coloured lighting kicked in and the music began. Between them was mounted the camera, which was simply my iPhone 6 with a clip-on wide angle lens, which was then mounted on a small tripod. 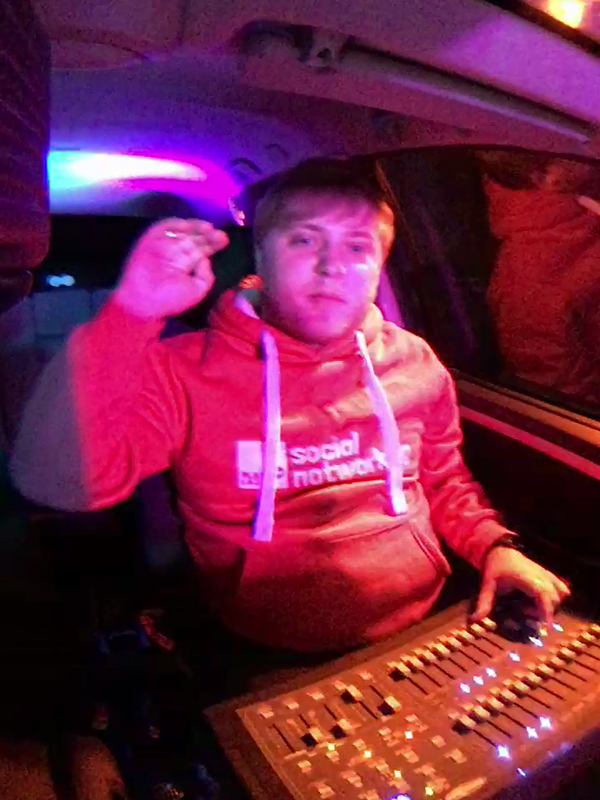 All the lighting was wired to a console which I sat on my lap in the passenger seat during the filming of the video – in fact, if you watch closely you will notice that I only ever have one hand in shot, the other one is always controlling the lighting desk. It was quite a challenge to sing on video and control the lighting at the same time! The above unflattering image shows the lighting desk in situ on my knee, and was taken as I was programming the lighting desk with the necessary sequences and lighting states to create the video. And yes, I was playing music and dancing along to get into the mood in the video from which this photo is taken. Don’t judge. As a bonus the above image is taken from one of the two as-yet unreleased Spanish versions of the video, in which I can be found singing both a medley of classics from old Spanish one-hit wonders, and a super cheesy classic called Una Estrella en Mi Jardín. I’d like to once again thank both my mum for starring in the video, and my dad for helping with the process of installing all the lighting, and I’ll leave you with another bonus photo – this time a GIF of me and my mum warming up for our performance by dancing along to Oops Upside Your Head. You’re welcome.